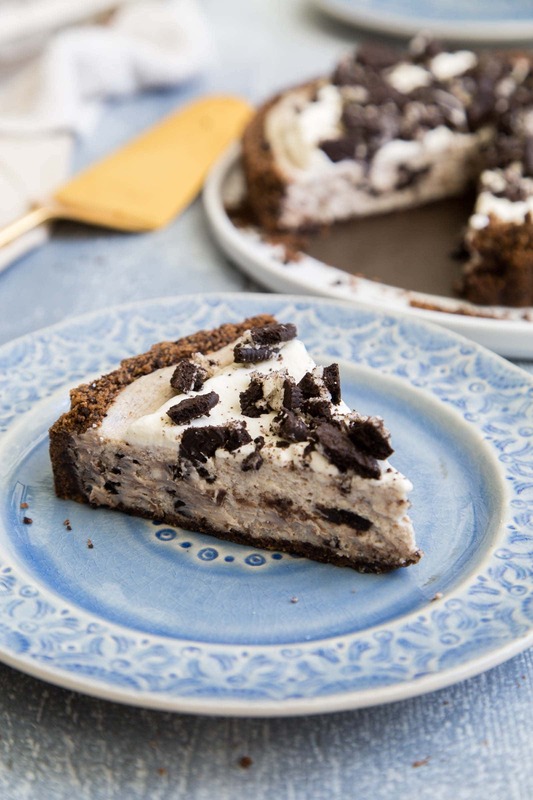 This Oreo cheesecake tart has all the flavor and richness of a standard cheesecake in smaller, shallower scale. The holidays mean cheesecakes galore! Every holiday gathering I’ve ever attended has at least one cheesecake for sharing. Whether it’s a giant Costco cheesecake or a vegan tofu cheesecake (because I’m from Los Angeles), cheesecake is an essential player. To me, nothing beats a slice of tall, rich, and dense New York cheesecake. It’s my kryptonite and unfortunately, it causes major havoc to my waistline. 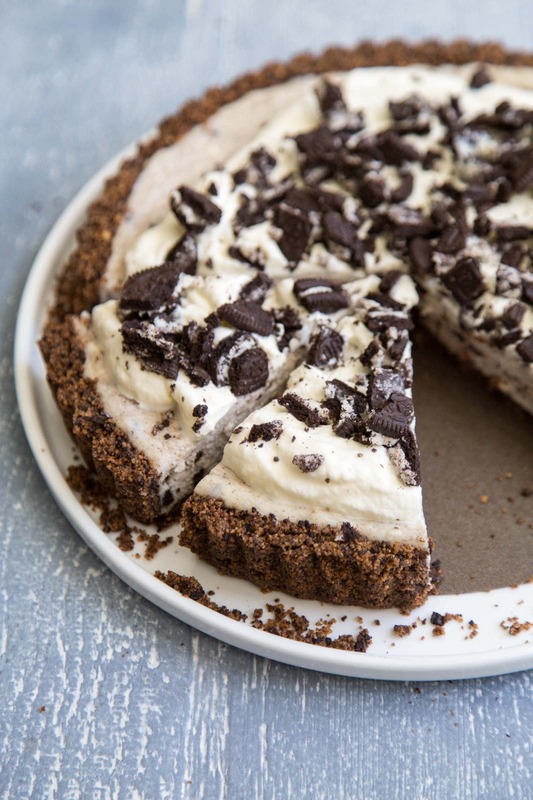 While this Oreo cheesecake tart is by no means healthy or light- it does provide the same richness as a standard cheesecake but on a smaller scale. By using a shallow tart shell, I’m able to greatly reduce the amount of cream cheese in the recipe. Best of all, the crust to filling ratio is much better. You get more crust per bite. A standard 9-inch cheesecake recipe uses at least two pounds of cream cheese and nearly half a dozen eggs. It includes melted butter and sour cream among other delicious ingredients that adds to its heavenly decadence. This shallow cheesecake only uses one pound of cream cheese, one egg (! ), and half a cup of sour cream. That’s where any of hint of lightness ends. Because then I add a generous amount of chopped Oreo cookies into the mix. I love Oreos. (Not sponsored.) I incorporate Oreos into all my favorite desserts: Oreo donuts, cookies and cream rolls, Oreo caramel dipped apples, Oreo brownies, Oreo coffee cream parfait. Every time they come out with a new flavor, you bet I’m buying a package. But of course I’ll always be partial to the original. 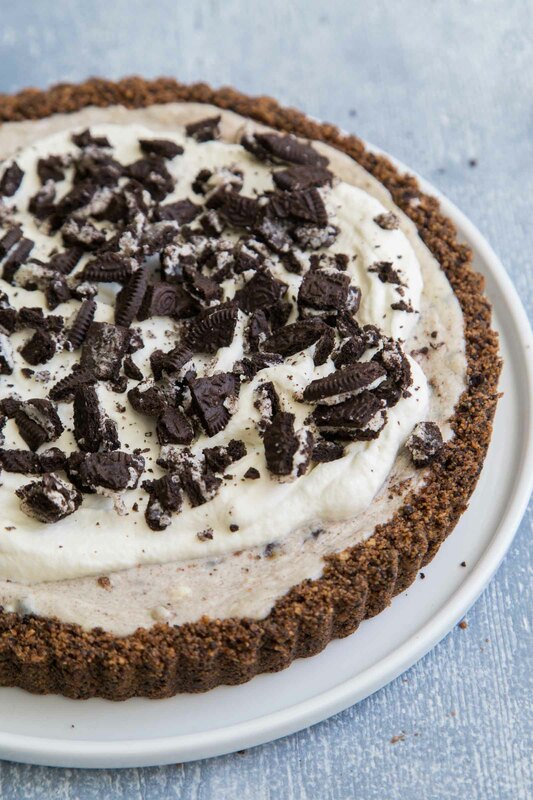 This Oreo cheesecake tart includes Oreo cookies in the crust, filling, and topping. 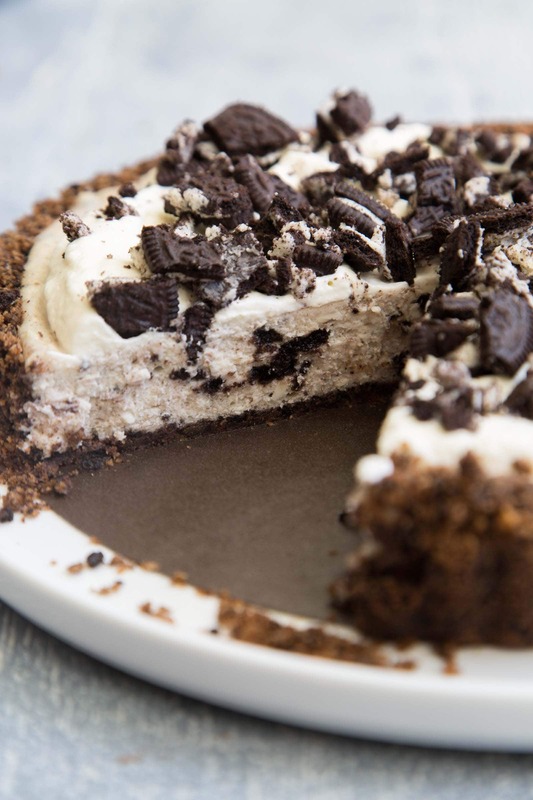 The crust is a mixture of graham crackers, Oreo cookies, and touch of cocoa powder. It tastes wonderful on it’s own and I could eat the crust by the spoonful. I use full-fat cream cheese and full-fat sour cream in all baked goods. I’d rather use the good stuff. I haven’t had much luck with low-fat cream cheese or low-fat sour cream. The added moisture in these products throws the balance off. Let’s face it, about 80 percent of the recipes I share are sweet. I make desserts daily. And yes, I taste everything and often test each recipe at least three times to ensure its viability. And because of all the sweet things that come out of my kitchen, I’m all about moderation. I won’t deny myself dessert, but I rely heavily on portion control. I’ll slice myself a tiny little wedge. I’ll eat it super slowly and savor each little morsel. And then I’m done. I’ll package the rest and send them away to make others happy. 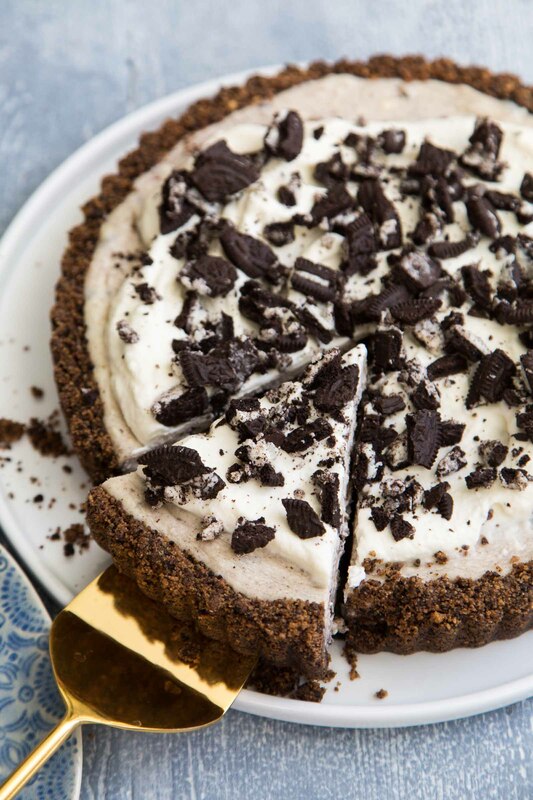 These Oreo cheesecake tart will definitely spread cheer and joy. 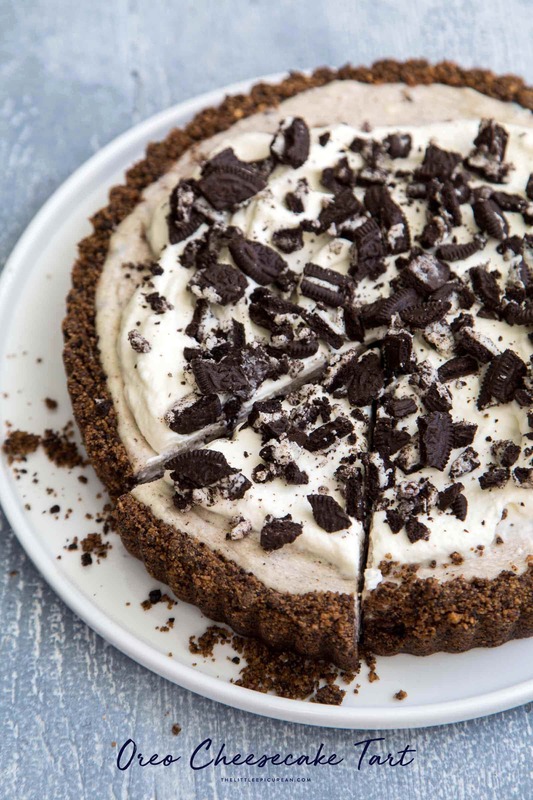 Crust: In a food processor, pulse together graham crackers, Oreo cookies, cocoa powder, and salt. Stir in melted butter. 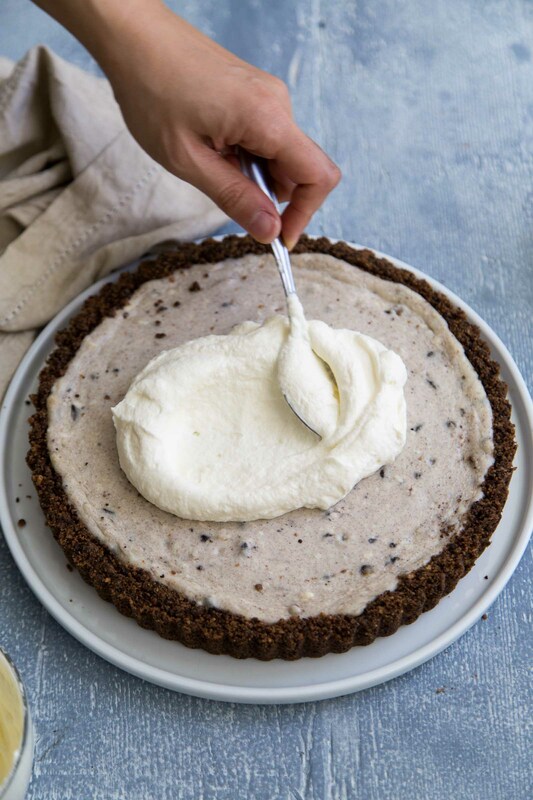 Use the flat bottom of a drinking glass (or measuring cup) to press mixture into the bottom and up the sides of a 9-inch tart pan with removable bottom. Cheesecake Filling: Use a hand mixer to beat together cream cheese, sour cream, and sugar until smooth. (Alternatively, use a stand mixer fitted with a paddle attachment.) Add egg, salt, vanilla, and heavy cream. Mix until incorporated. Scrape dough sides of bowl to ensure thorough mixing. Fold in chopped Oreo cookies. Transfer filling into prepared crust. Spread into an even layer. Bake in preheated oven for 30-35 minutes until cheesecake is set. Cool tart on wire rack. Once cool to the touch, refrigerate for at least two hours. Topping: Spread whipped cream over cooled cheesecake. Garnish with chopped Oreo cookies.